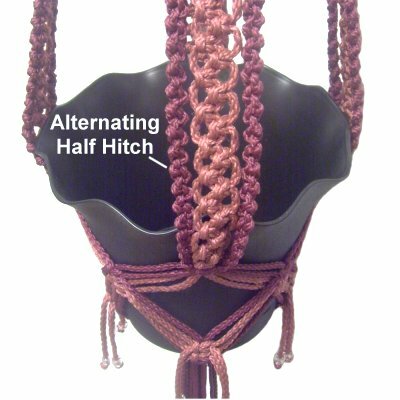 Description: The Alternating Half Hitch is a very common knotting technique used in Macrame projects. It has a chain-like appearance, and is narrower than most sennits made with other knots. 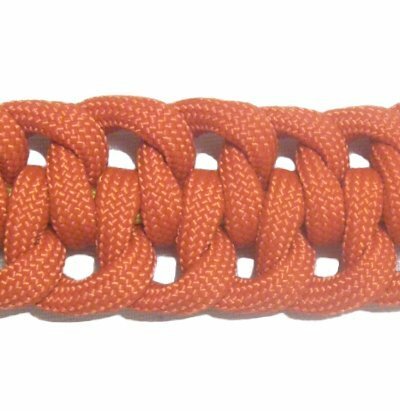 In some vintage patterns, the name of this knot is the Chain Stitch. In more modern texts, this design is sometimes called the Zigzag Braid. 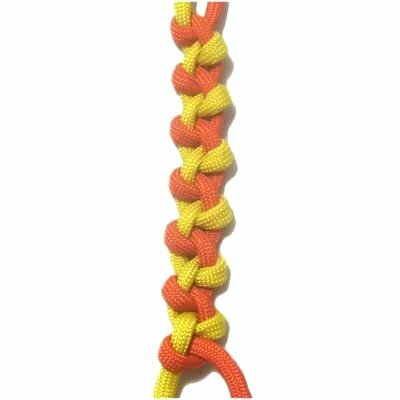 This decorative knot can be used to make a simple bracelet or necklace. Belts, handbag straps, jump ropes, and other long items can be made with a sennit like this. The key to success for this design is to work with the flat or round shape of the cord material, so the Half Hitches are not twisted or kinked. 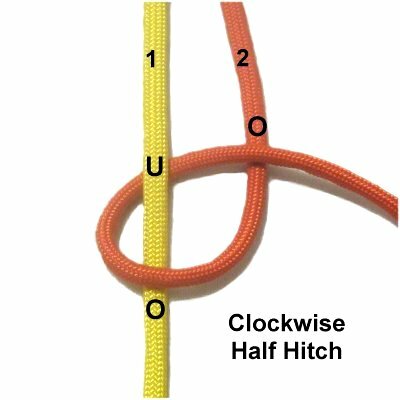 Half Hitch Patterns are variations of the Alternating Half Hitch. Each of the designs on that page require a separate holding cord. The working cords are used to tie the knots onto the holding cord, instead of each other. The Two Tone Planter is a Macrame project where this knotting technique is featured. The long, slender sennits resemble chains. Click on the link to view the pattern. You can see a larger image by clicking on the photo. Step 1: To practice, you need two cords, at least 12 inches long. Secure them vertically to your project board. I recommend you use two colors when practicing. Cord 1 (on the left) is the holding cord for the first step. Make a clockwise loop with cord 2, passing around holding cord 1 over - under. As you pull it to the right, pass over cord 2. Tighten the first Half Hitch so it grips the holding cord firmly. It helps if you pull the holding cord so it has tension. 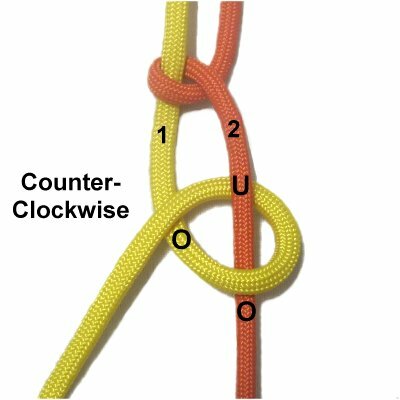 Make a counter-clockwise loop with cord 1, passing over - under cord 2. As you pull it to the left, pass over cord 1. Pull the end to tighten. Step 3: To continue, alternate back and forth between the two cords to tie more Half Hitches. Designer's Tip: Try to tighten each of the Half Hitches the same amount, to keep the sennit the same width all the way down. Have any comments about the Alternating Half Hitch? Contact Me.